This is the very best Grade A Degummed Hemp Fiber Available. The fiber has been thoroughly cleaned of most all debris such as woody stalk and core pieces from hemp plant. What is left is the inner bast fiber which is combed and cleaned to be spun into a yarn for weaving and knitting. The appearance is similar to cotton. 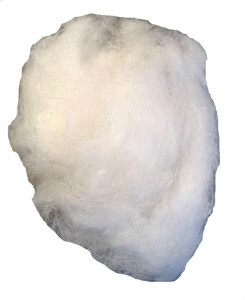 This material can be used as a stuffing for hypo-allergenic persons sensitive to allergies from harsh chemical fiber batting and stuffing material. It can also be used as a wicking material for e-pens, high end mods and other types of vaping systems. We have received great feedback from customers using this as wicking material. They say it resists burning at higher temperatures, has a clean all natural type taste to it and is free of chemical processing. Leaving you with an all natural hemp wick material.